The seven-member quota reform committee got 90 more working days to review the existing quota system in public service. The Public Administration Ministry issued a notification in this regard on Thursday. On July 2, the seven-member committee, lead by Cabinet Secretary Mohammad Shafiul Alam, was formed by the government to review/reform/revoke the existing quota system in public service. According to the notification, the tenure of the committee has been extended by 90 more working days in addition to its original 15 days. The other members of the committee are secretaries of the Public Administration, Finance Division, Liberation War Affairs, Legislative Division, PSC and PMO. The committee was initially asked to submit its report within 15 working days. The panel sat in a meeting on July 8 when it decided to review recommendations made by several public service reform committees and the Public Service Commission over the quota system. In April, students of public and private universities across the country waged a strong movement demanding reform in the quota system. As no gazette notification has so far been issued regarding the abolishment of the quota system as per the PM’s declaration, the leaders of the council gathered in front DU central library on Saturday to hold a pre-scheduled press conference to announce their fresh programme. 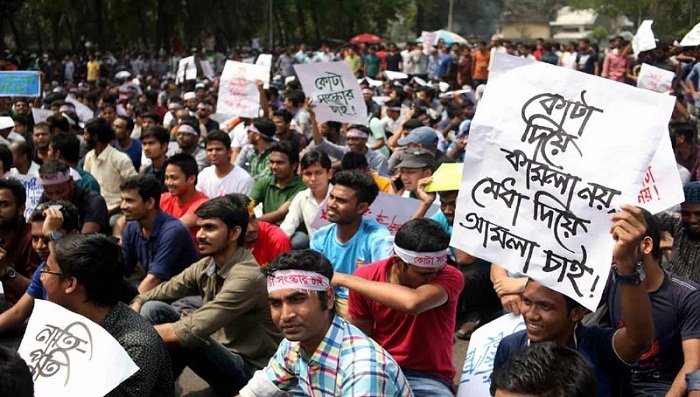 But, Bangladesh Chhatra League activists reportedly carried out an attack on them, triggering protests at different universities in the country.